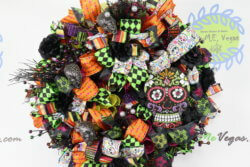 Valentines Day Fabric Skulls Hearts and Roses Wreath Celebrate the season of gothic love with this hand tied custom wreath. 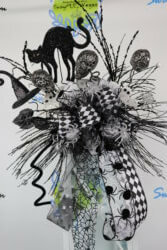 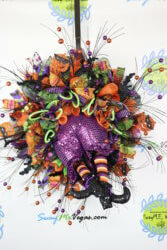 It is topped ..
Whimsical Witch Centerpiece Hello all of my pretties!!! 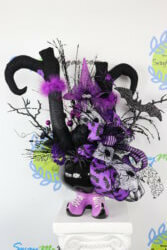 Halloween is upon us and what a fun and whimsical perfectly witchy centerpiece is this? 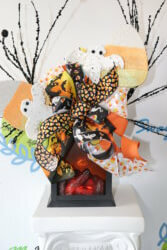 ..
Halloween Door Hanger Come in my Pretties!! 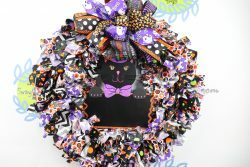 Welcome your Halloween Guests into your home with this beautiful metal door hanger featuring ..
Black Cat Halloween Rag Wreath Complete all your witchy halloween decor with this black cat fabric wreath. 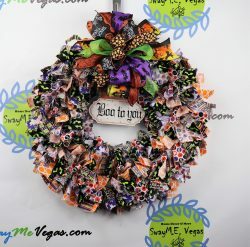 This handmade rag wreath features ..
Boo to You Halloween Rag Wreath Boo to You!!! 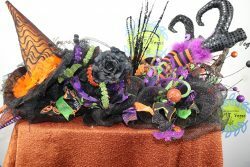 Here is a fun and festive handmade rag wreath to celebrate Halloween with. 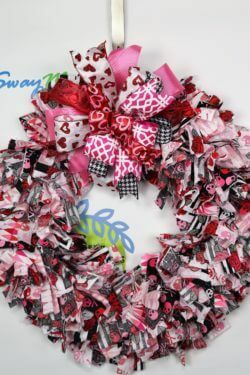 This handmade rag wreath ..